If there’s anything that can be said about horror mastermind James Wan, it’s that he has the ability to create nightmares out of completely comfortable environments. We’ve all had those moments in our home late at night when a couple of creeks and cracks emerge from the darkness. In those moments, we may tell ourselves that there’s nothing to worry about as we drift off to sleep, but one can never truly be sure. Wan is the man who dares to take us to those hives of paranoia and brings the demons we create in our mind’s eye to life. Never has this been more evident than in his 2013 effort, The Conjuring. It was love letter to the methodical, psychologically geared horror films of old Hollywood, that also incorporated the visual trickery that modern technology can bring to the table. It’s arguably his masterpiece, which makes the task of following it up three years later with The Conjuring 2 a truly terrifying one. After a brief cold opening that chronicles their investigation of the Amityville murders, the story picks up with paranormal investigators Ed (Patrick Willson) and Lorraine (Vera Farmiga) Warren in 1977. Lorraine’s psychic abilities have taken a great toll on her over the years, and after a foreboding premonition of Ed’s demise decides that she and her husband should cease their dangerous work for the time being. Meanwhile, a London family is facing a deadly supernatural threat. The spirit of a man named Bill Wilkins (Bob Adrian) is demanding that they leave what was once his home, and has taken a particular liking to tormenting Janet (Madison Wolfe), the family’s youngest daughter. Drawn in by the media circus the case creates, Ed and Lorraine attempt to aid the family while navigating a minefield of opinion about the validity of their claims. A messy room is the least of Janet’s worries. 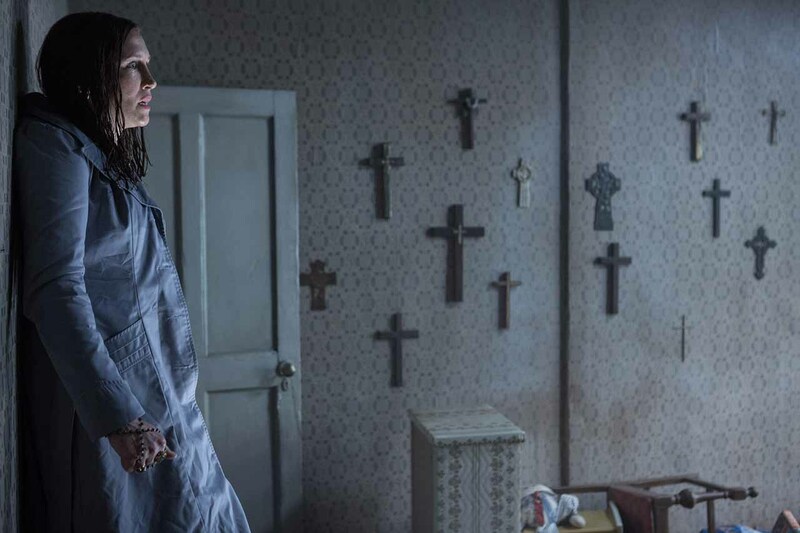 For a great portion of its rather long running time, The Conjuring 2 comes off as more of a practice run for Wan than a genuine attempt to create something new. Largely aping the structure of its predecessor, the first half of the film focusses mostly on the Hodgson family, with Ed and Lorraine’s story comfortably marinating in the background. However, that film had a far more interesting family, and the scares were very carefully calculated. We were a part of that family as the paranoia slowly ate away at them. Here, Wan seems more interested in essentially giving us the same sequence over and over again for about an hour. A child wanders around in the dark, an object moves, and Bill has himself a laugh over jump scaring another child. Despite all of the craftsmanship that goes into these sequences individually, they start to wear thin all loosely strung together. With that said, young Madison Wolfe is nothing short of a revolution here. Janet is put through the physical and psychological ringer here, and Wolfe makes every note of it feel completely genuine. She’s a confused kid who has to cope with her entire world crashing down, and her earnestness makes the fairly trite first half of the film bearable. However, things get a major shot in the arm when the Warrens come to London, mostly due to wonderful performances by Wilson and Farmiga. It would be easy to turn the Warrens into a pair of snide, bickering quipsters, but their relationship instead never veers from being utterly endearing. 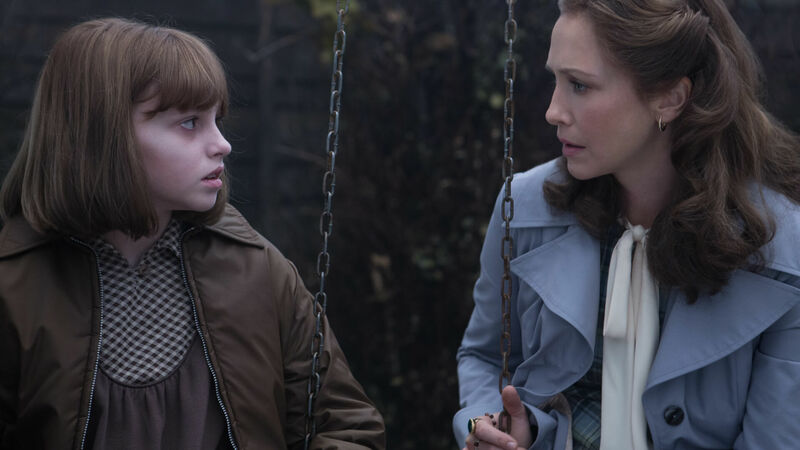 In fact, The Conjuring 2’s strongest moments are often completely unrelated to horror. Simply sitting with these people, seeing their love persevere no matter how scared they become, becomes the beating heart that keeps things going. It’s simply a shame that they aren’t more prominent, as frankly, the angle of people being skeptical of the ghost would have been a great deal more interesting if we were experiencing things completely from their perspective, without the previous hour which objectively proves that there is something supernatural going on. Although the storytelling is a bit weaker this time around, James Wan still hasn’t lost his touch behind the camera. This is a film that revels in having the audience see exactly what it wants them to see, and Wan’s liking for smooth long takes create a sense of crushing paranoia as we inch toward the next scare. In fact, the scariest scene in The Conjuring 2 does not involve any scares at all, merely a very clever use of perspective and focus to manipulate perception. That said, Wan does opt for a much more overt visual design here, drenching the film in an eerie blue while recalling the palate of the over the top Hammer films of the 60s and 70s in the creature designs. The Conjuring 2 is often crippled from achieving its full potential, blinded by adherence to what worked before. It spends far too much time revving up, making several of the admittedly well-crafted scares feel repetitive and silly. However, once the Warrens take center stage, Wan finally steers things in a new direction, and the film evolves into a final product that is more a successful character study than a horror show. Even so, it is still as good as one can do for a few chills at the movies right now, and will likely not anger the ghost of its big brother. We can only hope. Have you seen The Conjuring 2? Let us know your thoughts in the comments below. Characters: The Warrens are the consistent highlight of the piece. Their tender relationship and overpowering love for one another regardless of circumstance standing as the film’s backbone. However, The Hodgsons are a fairly generic scared movie family, and the film spends way too much time on them. Cinematography: James Wan’s camera is one of the most playful in the business. He and Don Burgess work absolute magic here, weaving through the many haunted homes here with both ambition and precision. A large part of the film’s scares are dependent on this camera movement, and it delivers in spades. Story: Unfortunately, this is where the film largely falls short. So much time is devoted to the Hodgson family that it ultimately muddles the potentially interesting themes of the haunting of their home being subjective. Once the Warrens make their way into the forefront things do pick up considerably, and some rich and often very sweet themes start to reveal themselves, but they can’t quite lift up a screenplay that seems desperate to re-create the structure of the original Conjuring. Acting: Uniformly excellent. Patrick Wilson and Vera Farmiga not only have spectacular chemistry but shine as individual characters a great deal more than before. Meanwhile Madison Wolfe’s turn as the insatiably tormented Janet is one of the most daring ever given by a child actor, and potentially warrants consideration for a Best Supporting Actress nomination. The Conjuring 2 is the sequel to the 2013 smash hit in which Ed and Lorraine Warren are thrown into yet another horrifying paranormal case. A wonky, repetitive first half. Michael Fairbanks is a lifelong film lover from San Diego, California. His favorite movies include The Dark Knight, Silver Linings Playbook, and As Good As It Gets. In addition to The Nerd Stash, Fairbanks writes for both The Young Folks, and his own blog, entitled Fairbanks on Film.